I've been looking for a 16.5" Sunpod to add to my 14g BC, and they're hard to locate. Can I add T5 or halides to the stock hood? Where can I find ones that fit? 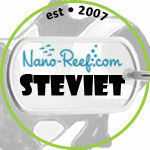 Or is the nano tuners 3.24 upgrade the best route? I have never heard of a T5 retro kit, but I have seen people mod halides into a stock hood. I think you would almost have to get a chiller with in-hood halides. If you don't mind removing the hood you could go with the sunpod. Sunpods have moveable legs so actually any size would work on your tank, it just depends on how much overhang you will have. I just purchased the BioCube 29 Gallon and this was very helpful. Thanks alot! Glad it was helpful, if you have any questions feel free to ask them here. That way others can learn from your questions. Let me know if you do find one, and I'd love to buy that 16.5 off you! I saw this idea done by Sinistard, but the topic is about 4 years old so I'm recreating it. Step 1.Cut the Molex connector off of the cold cathode Box Wires. Step 2.Strip the wires where you just cut the Molex. Step 3.Take the plastic protector off of the Biocube hood, then unscrew the screws that hold down the reflector. Step 6. Take the wires you stripped earlier and connect them to the Adaptaplug leads with wire nuts or you can solder it if you have a soldering iron.White to white, Black to Black. Step 7. Connect the other side of the leads to the DC Adapter. Make sure that the "+" sign on the leads meets the "Positive" word on the DC adapter. Step 8.Route the wires out of the back of the hood then close it all back up. Heres what the wiring should look like. Step 9. Plug the adapter into a power source and Enjoy! When you guys say that you cut between sections 1 and 2, where did you cut, how did you cut (slot shape or?? ), etc? Can you post pictures? How do you control the temperature in your BioCube??? I can't seem to make it work to the temp i want it to be. It always runs high like 81F or 82F, even though i have set the heater to 76F. During night it's 80.5F. The apartment is 65F. I have the Jager 50W heater in the first chamber. I tuned the heater off, and waited for the tank temperature to drop to 76F. Then I pulled out the little button on the heater and set the temp to 76F. But when I turn the heater on the water gets way above 76F. Set your heater lower. Set it at 72F and see what your temperature stays at. None of my heaters actually heat to the temperature they are marked at. These are a good option if you wish to keep the all-in-one look of your biocube. 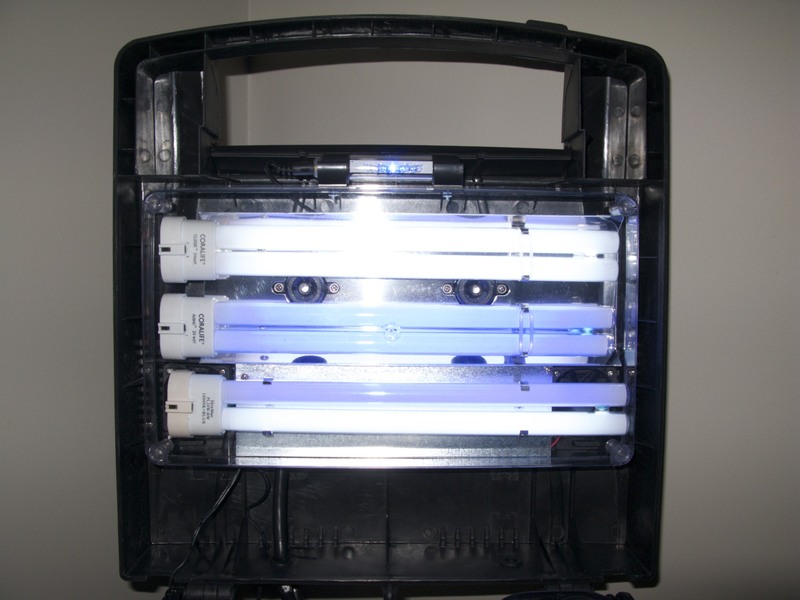 They increase lighting to your biocube by 50% for relatively cheap price. These come as kits and installation is required, but are fairly simple to install. It should be noted that even with these updates it is not recommend to keep anemones, clams, or sps corals. -Total output 72w after upgrade. If you are considering keeping SPS and Anemones, or just want the best growth out of your corals, you will want to consider one of these options. These modifications add Metal halide lighting to the stock hood. They are very expensive, but allow you to keep the stock hood. 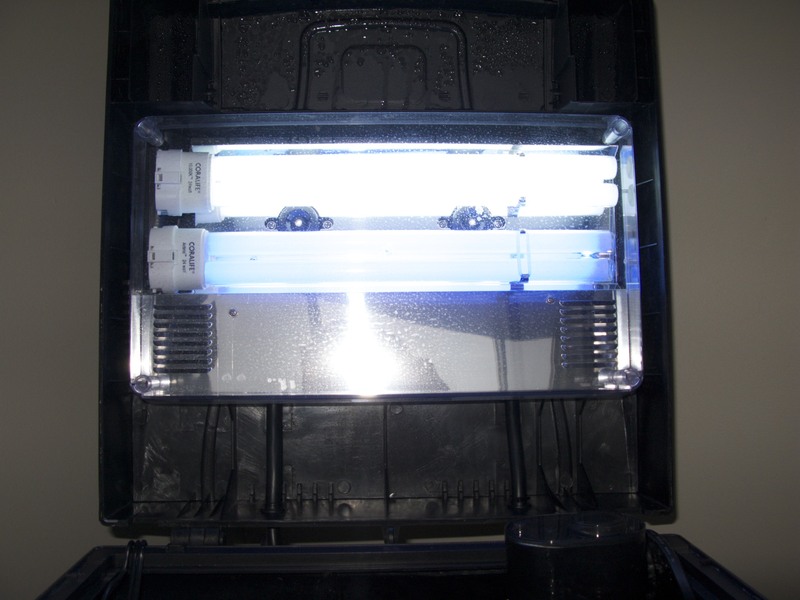 These lights are a more cost effective solution if you want to add metal halide lighting to your biocube, but require the hood to be removed. Another added benifet of these lights is with an open top heat becomes less of an issue. Sunpods have adjustable legs to fit a variety of tanks. They used to make a 16.5" Sunpod that was the perfect size for the 14G biocube, but that model has been discontinued. However they can still be found on ebay and classified. This is not an exhaustive list, and I have no experience or personal investment in any of the lighting listed above. uwwmatt, thanks!! The one I just bought already looks like that, so I guess the previous owner already did it. This is what I meant to post. Doh! Okay. So you're leaving a small amount there still, correct? Searching for stock PC replacement bulb I ran accross these. Anyone using or tried them? Received my 3.24 lighting upgrade with the fancy moon lights. These are pictures of old vs. new canopy. Note the moon lights by feeding flap. lol i used a knife on my first one but then just used a pliers on my new one. 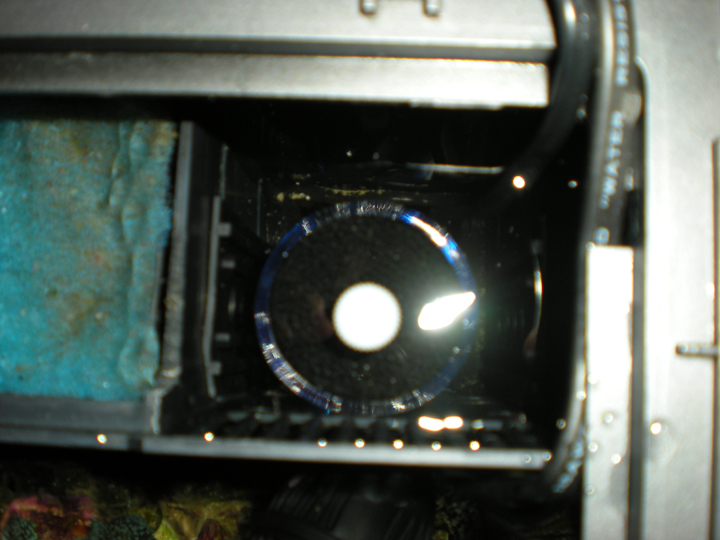 looks like it works good nice movement thru filter media that way I know it's working. Saving chamber 2 for their NC12 soon as I get it. Anyway. I wish they made an affordable kit for the 8gallon version. I just got the 8 gallon myself after my DIY tank crashed because I used the wrong Silicone. Easy way to slice off that 3/4 remaining valve is to heat up a knife and slice that baby nice and easy. That's what I did. I just go at BioCube 14g and I have a question on weather or not its glass? I know I read a discussion on it before but I couldn't find the thread. I swear it scratches way to easily to be glass.What kinds of cleaning tools/mag floats do you all use for the "glass". It says on their website that is glass "Curved Glass Front Corners"
I have a BioCube 14g and I use the Mag-Float medium for glass (white color). The one for acrylic is blue color. I don't have any scratches. Make sure there is no sand trapped in between.